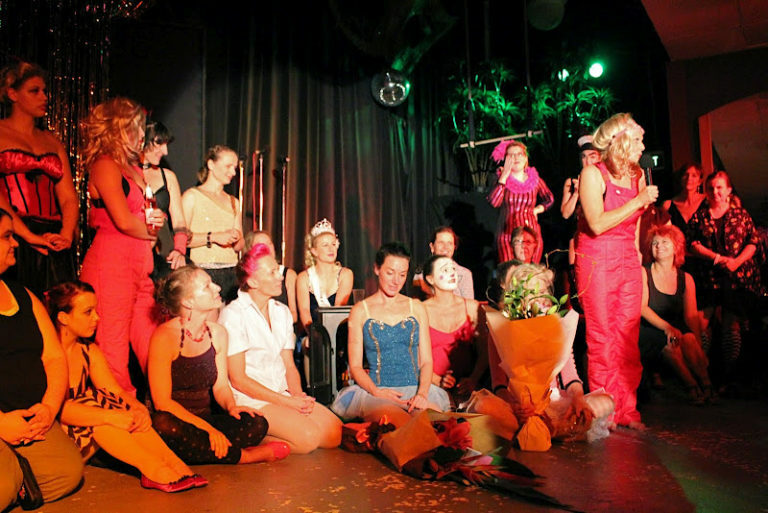 In March 2012, Circus WOW (Women of Wollongong) celebrated 10 years as a community Women’s circus with a fabulous, big, sparkly show and exhibition, bringing together old and new acts, and founding and current members. Circus WOW has bought much colour and laughter to many local events in the Illawarra, such as Viva La Gong, Folk Festivals, and The Vault Cabaret, as well as representing the Illawarra outside of our region at events such as the Perisher Folk Festival, the Hoopla National Circus Festival at Darling Harbour, the National Circus Festival in Tasmania and the Yeppoon Festival in Queensland. But WOW is not just about fun; through performance, we aim to throw light on feminist, social, political and environmental issues. The show ‘Bonded’ demonstrated this as it portrayed the plight of women in our dying manufacturing industry. WOW also maintains an outreach program aimed at reaching socially isolated and disadvantaged women, youth and children, providing a way for them to express difference, build self esteem and confidence and find acceptance and laughter along the way. The 10 Year exhibition opened at Paul de Vries Gallery on 25th of March, with photos, video, costumes and props from acts in the last 10 years. The exhibition was put together by local artist, and member of Circus WOW, Libby Bloxham, with the assistance of other WOW members. This followed on from an earlier taster exhibition during 2011, a Pop Up Exhibition, supported by Wollongong City Council, that coincided with the annual Wollongong Festival, Viva la Gong. To much anticipation, the Circus WOW 10 year Show, “WOW! What a Story”, opened at The Vault in Port Kembla on 31st March. With Wendy Regan as director, and more than 30 performers, it was a celebration of the talent, creativity, and humour of the Women of Wollongong. The audience was taken on a journey through time, revisiting old acts with original cast members, as well as showing the new talent from recent years. Performing with WOW were old and new friends: Women’s musical groups Cheeky Tzatziki, and Eklektika, as well as WOW members who have gone on to become professional circus and burlesque performers Emma Khourey and Heidi Hillier and Penny Lowther. Circus WOW put on a show filled with laughter and joy. It was a celebration of the work and dedication by volunteers to keep WOW going through the years and the ongoing, outpouring of creativity and skills. Following 2 sold out shows, Circus WOW entered the next 10 years with vigour!! With the hard work of our committee and members, WOW will continue running training, performing, and supporting local women, and we hope to find a stable home soon!